RC Truck Model Peterbilt 359 1:4 Towing Two FIAT 500! - Muscle Cars Zone! 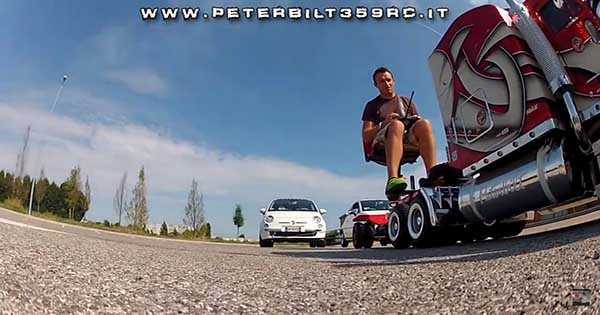 RC Truck Model Peterbilt 359 1:4 Towing Two FIAT 500! If you are into scaled down truck replicas than there`s a pretty high chance that you are familiar with the truck model Peterbilt 359 built by master builder Luca Bordin. Every time we see Luca in a new video with his amazing creation we know it`s going to be something great. We can safely say that we got what we expected in this one as well – complete madness. This Peterbilt is scaled down to 1:4, and maybe it`s potentially one of the most powerful RC Peterbuilts ever built. In this one, Bordin decided to demonstrate the amount of power this RC Peterbuilt truck has with towing not one but two FIAT 500 cars! This just shows the dedication Bordin has when it comes to making his truck powerful as it can physically be. With you who are not familiar with Luca Bordin and his RC truck model Peterbilt 359, we are going to go into some history. Luca Bordin chose this particular model to be his scaled down lifework because Peterbilt is his favorite truck brand. Back in the days, when he was just designing the chassis of this truck to match the full-scaled version he spent up to 2000 painful hours. He managed to finish the trailer somewhere at the winter of 2011. This is when the truck was complete and Luca Bordin managed to put himself in the annals of RC truck building history. To make it even greater, Luca Bordin is not shy at all when it comes to revealing his secrets. He decided to upload the manual on how to build this exact truck. The book is consisted of high resolution photos and its available in all digital versions. At last, if you are looking for a towing RC truck, follow this link!